How does one produce something new? What is the status of the new? In the very act of posing such questions as essential ones for psychoanalysis to answer, there is already implied a particular orientation to its theory and practice. In the first place there is implicit to the very articulation of these the notion that psychoanalytic work is not concerned with a ‘remembrance of things past’ which would amount to a simple rehash of this past, a view which in its turn has profound implications for any understanding of those central concepts of transference, transmission and interpretation. One might add that, in the genesis of every human subject out of vagaries of the past, the ’hole’ will always be greater than the sum of its parts. This paper deals with the question of neurotic depression from a Freudian point of view. This means that I will try to isolate some elements towards developing a theory about the neurotic depressions that could have been Freud’s own theory – because, as you know, Freud himself did not develop an explicit theory on this point. For this purpose I have collected together a number of remarks on depression which are to be found scattered throughout his work. These remarks could be compared to a kind of latent thought from which it should be possible to construct a manifest Freudian theory of the neurotic depressions. With Lacan we could say: a theory of the depressions within the structure of the hysterical discourse. In what I have been saying up to now, some of the crucial points in every psychoanalytic discussion of the depressions are already implied. Previously, I explained that sexual depression of the anxiety-neurosis type does not have a psychic or symbolic etiology, (related to Oedipus, castration and so on) – but that it corresponds to a psychic lack or a lack in the signifier, with a direct transformation of the real of sexual jouissance. I also pointed out that ‘melancholic’ depression at the end of the analytic experience of the neurosis has another kind of real etiology, the identification with the real of the object (a). Reading Lacan over the years I have often found myself, like Joxer in The Plough and the Stars in a state close to intoxicated perplexity. ‘What is the moon and what is the stars?’ are however questions which occupy me less than ‘What is the subject?’. Obviously one can address this question to the widest possible forum of experience but in Seminar VIII it is anchored to the issue of transference, and is linked repeatedly to the fundamental fantasy. The most striking feature in these repeated references is that this subject, the subject of the fundamental fantasy is a fading or vacillating subject. The term ‘fundamental fantasy’ itself has an archaeological ring about it which would have pleased Freud. Even more poetically perhaps, Lacan’s desiccated algebraic formula $*o evokes in its strict neutrality those grey Japanese paper twists which when immersed in water, blossom into myriad multi-coloured flowers. Beneath the proliferating wealth of fable, myth and legend, beneath the multiplied scenarios of daydream and story, are we not to imagine this seemingly static formula, unvarying and absolute, yet capable of engendering almost infinite permutations? And it is not simply our fantasies and our creativity that this formula subtends. It magnetises the most disparate of biographical data, shaping it according to the inexorable curve of unconscious desire. For all of us as for Alcibiades, despite apparent contradictions, what is at stake always in the successive high points of our lives is as Lacan says ‘the same supreme point where the subject is abolished in his fantasy, his agalmata’. The Freudians appear to have been outstripped by a modernity which they contributed in fashioning, and by a femininity which up till then had not dared to be spoken or to show itself, which besides they were amongst the first to bring to light; they had even given it a prime place in setting it at the centre of their clinical and therapeutic project. They feel out of their depth to see displayed in broad daylight what constituted one of the knots of repression for them and so, some of them at least, question themselves about their responsibility in this ‘return of the repressed’, astonished, sometimes shaken, to meet a bisexuality for which their theoretical struggles must have paved the way, and which corresponds to their most daring hypotheses, on the first street-corner. Could it just be the most recent and the most provocative disguise /unveiling of a never-mastered hysteria? They find themselves, sometimes in spite of themselves, at the place of the elder or ancestor, a position which in a way they have always occupied and even claimed as theirs, powerlessly witnessing effects of their teaching that they had neither foreseen nor wanted, at least in that form. There’s no doubt that a certain modernity is overtly inscribed on the other side of their discourse which nevertheless authorises it implicitly, even to the finest detail. This complex relation should not worry them because it constitutes an opportunity and a sort of challenge that it’s up to them to rise to, like a travel invitation perhaps permitting them to make new discoveries. Nevertheless, a pure discussion of ideas is not what is called for here, rather they should go back to what constituted their point of departure, meaning the clinical research which is the hallmark of their originality. There is nothing doctrinal about our office. We are answerable to no ultimate truth. We are neither for nor against any particular religion. Lacanian psychoanalysis has strong theological overtones. Witness Lacan’s concept of the ‘name-of-the-father’, his epistemological triumvirate of the Real, the Symbolic and the Imaginary orders which remind us of the Trinity. Indeed, in Desire and Its Interpretation2 he relates the Trinity to the Oedipus complex and its three moments. Clinically there are three structures – neurosis, psychosis and perversion. He describes his expulsion from the International Psychoanalytic Association as an ‘ex-communication’. He talks of the Other, and in The Formations of the Unconscious3 he instructs us to go out into the world ‘as apostles of my word, to introduce the question of the Unconscious to the people who have never heard it spoken of, words reminiscent of Christ’s injunction. He holds that in the beginning was the Word, which has echoes of St. John. There are innumerable other examples we could cite. 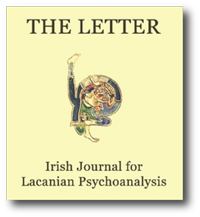 Critics have pointed to the ‘high Priesthood’ of Lacanian psychoanalysis. Throughout, Lacan seems to be saying re: his position on religion: ‘It’s for me to know and you to find out’. ‘Ambivalence, ambiguity, duality, dichotomy, bifurcation – these are the kinds of nouns customary when analysing Stevenson’ writes Frank McLynn in a recent biography, noting also that ‘the Stevensonian divided self is overdetermined at a number of levels’. Robert Louis Stevenson was born in Edinburgh in 1850 of strict Calvinist parents, and it is this religious background that offers the first clue to his lifelong preoccupation with duality. Calvinism posits a number of radical oppositions, such as predestination and free will, faith and works, grace and nature. In Calvinist terms, the fall of man is so total he is incapable of mitigating, let alone reversing, its sinful effects. Good works and outward manifestations of righteousness are worse than useless if seen as paths to salvation, serving only to mask corrupt wishes and desires. Calvinism as such, embodies a radical suspicion of human motives and a keen awareness of the possibilities of human duplicity. It is perhaps not surprising therefore that some have seen in psychoanalysis its secular equivalent. However, as I hope to indicate, there are other reasons why Stevenson’s preoccupation with duality and ‘doubles’ is of interest to psychoanalysis. There are people who suddenly lack their support for existence and who, instead of sinking into depression, begin to hate the one whom they think has this support; that he has taken or stolen this support from them; and in this hatred, they find the support they need to exist. The two notes that follow formed the basis of a discussion with psychiatric and nursing colleagues in St Vincent’s Hospital who at that time (1981) were rather skeptical about the clinical relevance of Lacan’s work. They are reproduced here for the convenience of students who claim they still help clarify the way in which Lacan re-articulates Freud’s case histories. The note on Dora is based on Intervention on transference (1951) which has since been translated into English. That on Hans gives a very condensed account of Lacan’s exhaustive commentary on the case in the still untranslated seminar on ‘La relation d’objet’ (1956-1957). The Fragment of an Analysis of a Case of Hysteria (1905) was Freud’s first extended account of the process of a treatment using the psychoanalytic method; the first also in which he tried to deal with the question of his own position – the position of the analyst – in such a treatment. Here, for the first time in the literature, the problem of transference and counter-transference emerged as being of decisive importance in the success or failure of an analysis. Is it misguided to write a ‘beginners book’ on a thinker as complex, obscure, fluid and rich as Lacan? It depends perhaps, on to whom the book is addressed. In Lacan for Beginners, Darian Leader has made a Trojan attempt to condense the mighty corpus of Lacan’s life’s work into a entertaining concoction suitable for general consumption. This is the formula of the excellent Icon books series, their wide appeal being the ability to wed distilled knowledge to a cartoon-like format, without pretending to be other than what they really are – an aperitif. In fact, the imaginative illustrations by Judy Groves uncannily portray Lacan as he really was, a larger than life character reminiscent of the heroes and villains of D.C. comics fame.